“If nobody writes about it, then the content is a tree falling in the forest without anyone there to listen.” That’s how Dixon Jones, Marketing Director of Majestic, illustrates the importance of getting the right links to your content. We proudly announce that Dixon will be speaking at YoastCon 2017 on November 2! Learn link building from the best! Get your ticket now for YoastCon 2017! Dixon Jones has worked at the forefront of search marketing since 1999. He became the Marketing Director of the world’s largest link analysis engine, Majestic, in 2009, transforming the SEO industry by providing link intelligence on a scale not previously open to the industry. Here, you can discover what he has to say about link building in 2017. Majestic is all about links. If you compare links to other ranking factors, like content on a page or technical optimization, how would you rate the importance of links? Any examples to illustrate this? In March 2016 Google’s Andry Lipattsev revealed that links remained one of Google top three ranking factors. In February 2017 Google’s Gary Illyes confirmed that the PageRank algorithm that made Google what it is today was still part of the algorithm. So yes – links are highly important, but these days there is a big difference between “a link” and “a link that counts”. Most links are hardly worth the screen they are written on. Over the years link building changed a lot. Obviously, buying links is not the way to go. But what do you advise site owners if they want to get valuable links? In a white hat world, you really should be considering the nature of the people that will be reading the page that the link is on. Are they real people? Is it a real story that relates to them? Does the link add to the story and is it a continuation of the user’s quest for knowledge? Is your content the END POINT for that quest? Some site owners might find it easier to get links from Facebook or Twitter than from other websites. How do social links compare to links from other websites? What would you invest in more? Facebook and Twitter create short term noise, but unless that noise translates into others writing evergreen content that links to your site, the benefits are transitory on social. But I think of Social links as a stepping stone to long term success. They give you a tannoy to broadcast a new message… but if the wrong people listen, then nobody will write about what you have to say. If nobody writes about it, then the content is a tree falling in the forest without anyone there to listen… does it make a sound? When a site owner analyzes their site with Majestic SEO they’ll get a trust and citation flow score. How can they put these metrics to use to help them optimize their site? Find candidate sites for getting links to your content. Find the influencers on these sites. Convince them of the merits of your business and content. You can start by just typing in a keyword into Majestic to find the candidate sites or you can look at up to 10 competitors and find the hubs of authority for your niche. Both strategies can work well. Majestic is often used for competitor analysis. Is there a set workflow in Majestic that you can recommend to a new Majestic user who wants to analyze the competition? Yes. Many people use the “Clique Hunter” to look at sites that link to three or four or more competitors but not to themselves. For some businesses, this creates quite a list, but re-sorting the list can put the best candidates near the top. To the right of each domain is a little cog. Use the cog to select candidate sites to approach and select the “add to bucket” button. You can do this all day, and when you are ready, click on the bucket icon at the top of the screen and you can export all the sites out as a .csv file to approach the influencers for these sites. Alternatively (and indeed – in addition) I strongly urge users to set up a campaign dashboard as soon as they have an account on Majestic. This starts tracking their niche and from these dashboards, you can easily analyze the sites in any of Majestic’s tools by using the “Export Sites To…” button. We assume this interview has convinced people to go see your presentation at YoastCon on November 2! In the unlikely case someone is still in doubt, what’s the main reason they shouldn’t miss it? 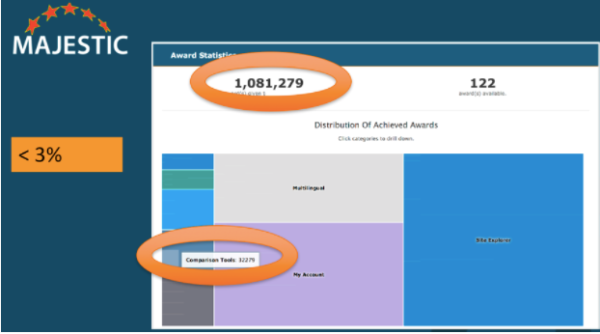 The chart below shows how our Gamification system has distributed 1 Million “badges” on Majestic. Only 3% of all badges were for areas of our site related to comparing websites. This tells us that most users are really only scratching the surface of what Majestic can do for them. 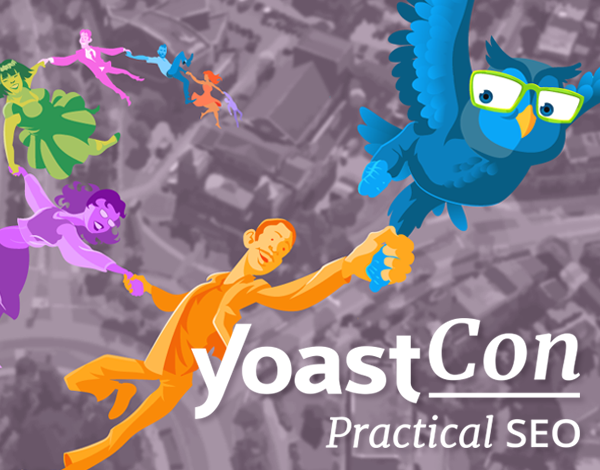 Yoast’s conference is a chance to go deeper. You’ll find out things about links analysis you never knew was possible.